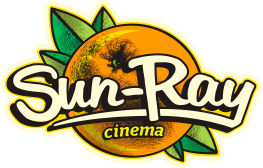 Online ordering menu for Sun-Ray Cinema. Here at Sun-Ray Cinema, we serve salads, sandwiches, hot dogs, and popcorn. Don't forget to try one of our pizzas such as the Black Lagoon Supreme Pizza, Uncle Meat Pizza, or the Cowford Pie. We're located just south of I-95 and Riverside Park at the corner of Park Street and Post Street. Order online for carryout or delivery!